It was a pretty late night and I didn't wake up until 11:00 and got up at noon. We packed up, loaded the car and checked out of the hotel at 1:00. I went back to Le Cid Café at 1:15 for another excellent cappuccino and worked on stitching panorama photos. We finally got ready to say good-bye to this exciting little city on the Rhône. We were setting out on a very ambitious journey today, hoping to cover many interesting sites before finally arriving in the city of Arles. As it turned out we never got there and we didn't realize how big a holiday Bastille Day is to the French. 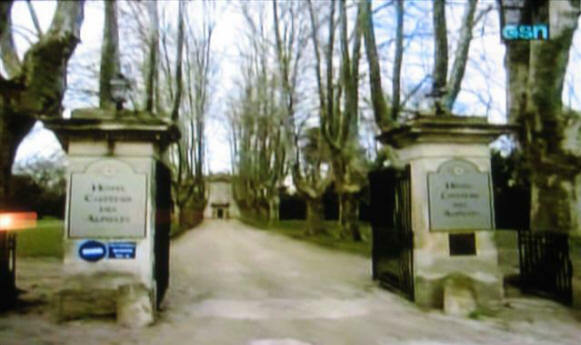 Anyway, at 1:50 Marcia drove east for the 25 mile trip to Gordes. On the way there we decided first to stop at the Village des Bories, which I had read about in the guidebook. Once we turned off on this dirt road on the slope of the Lubéron mountains, it seemed like it took forever to finally get there. We arrived at 2:35 and it was very dry and dusty. This village is a museum now, so we had to pay to get in. "Bories" comes from the Roman "boaria" meaning cowsheds and they are a primitive habitat of beehive-shaped huts built of overlapping dry limestones (lauzes). The walls are 4 ft thick and they have openings for doors and windows. They were first constructed in the Neolithic age. The twenty reconstructed ones here were inhabited from the 16th-20th Century. Below is the approach to the village. They come in all shapes and sizes and some of them are joined together to form larger complexes. Here is a smaller one and you can see, on the right, what they look like inside. Below are shots of what the furnishings might have looked like. The lower right photo demonstrates almond trees growing inside one of the houses. We are in an area called Le Parc Natural Regional du Lubéron which covers 463 mi2 (120 K hectares) and is a limestone mountain range east (the Grand Lubéron, with peaks as high as 4,000 ft) and west (the Petit Lubéron). 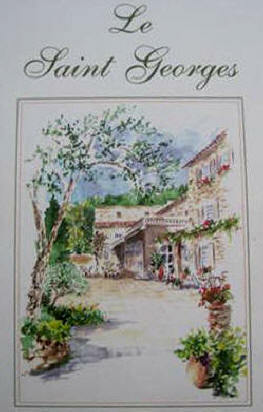 At 3:05, we left the Bories and drove the dusty road back to the main road heading toward the town of Gordes. The aerial map to the right shows the hill town on the left side (white buildings) and the steep cliff just to the right and at the top the large green valley of the Coulon River plain. It was quite beautiful to look at as we took the serpentine road to get to the top. The stone houses are cramped together as they spill down the hill. The Castle and the St-Fermin Church dominate at the top. When we finally arrived in the little town, it was obvious parking was going to be a problem so we decided to park in the La Bastide de Gordes Hotel lot pretending we were going to eat there. At 3:15, we walked into the hotel and found our way to the rear terrace and ordered coke and water. As you can see the views from the hotel terrace were quite spectacular. After we finished we each headed out independently since Marcia needed lunch and I didn't. I walked up the hill and got to the center of Gordes where the main attraction is the Castle (on the right) called the Château de Gordes which was built in the 16th Century by Bertrand de Simiane on the site of a 12th Century fortress. Only two of the original towers remain standing. The building was rented and restored by the Hungarian Op Art painter Victor Vasarély (1908-97). It now houses many of his works in the Vasarély Museum. It was closed by the time I got there. 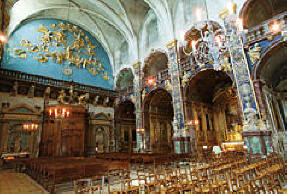 At 3:30 I headed over to the L'Eglise Saint-Firmin which was named after the Bishop of Uzes who died in 552. The first church here was Notre Dame built in the 11-12th Century. This latest edifice was built in 1755. The building is squeezed right next to the Castle making it difficult to take a picture of it. Below left is the backside of the Castle and on the right is the church taken from behind the fountain in the courtyard. I went inside and it was very nice. I walked down this street to get to the lookout wall. I finally reached the wall and again the view was incredible. Marcia had gone on her own to explore and find a place for lunch. I finally found her at 4:00 at Comptoir de Arts eating a Salade Comptoir which she seemed to have enjoyed. That bush in front of her is not the salad. Here is an example of one of the French ATMs. As we walked back to the car, we stopped in a gallery and the owner told me absolutely no photography. Had to do it. At 4:50 we drove back down the hill and then headed west this time to find the famous little town called Fountaine-de-Vaucluse which is the source of the Sorgue River. It only took us a few minutes to get there through beautiful countryside. We arrived in the center of the town and found a place to park. In the center there is a column dedicated to the famous poet, Francis Petrarch, who lived here for 16 years (1337-53). His home is now a museum (Musée Pétrarque). Here he wrote his most important Latin works and sang for his love of Laura de Noves of Avignon who was married to Hugues de Sade and had 11 children. He pined for her for 20 years and she died of the Bubonic Plague on the same date he first saw her. This column was erected in 1804 in honor of his 500th birthday. On October 14, 1954, many citizens of this town reported seeing a large UFO. Click date to read about it. We started the long walk to see the source of the River Sorgue which is very unusual. It was relaxing here. In the upper right you can see the flag on the ruins of the castle on the hill above the town. It was the property of the Bishops of Cavaillon. 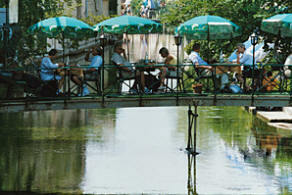 As you head for the Sorgue Source, there are many vendors selling all sorts of things for the French tourists. They must be especially fond of cicadas (center & right). This area is very well known for growing of lavender and more so its close relative lavaradin (lower left). They sell it form these large sacs. At 5:00 we climbed the long trail to the source of the river. The scenery along the river was beautiful with areas to stop and picnic which many families were doing. We arrived at the source which in the summer is only a deep pool of water. This pool is fed by multiple underground rivers draining the plains above. At least that is the theory. No one knows where the water is coming from even though many have tried to explore it including Jacques Cousteau. As we approached the tricky area, Marcia was a little wary and didn't go down to the edge. Its pretty slippery getting near the edge to look down at the pool. But once you get close enough to the pool, this is what you see. It looks like a little pond in a grotto but it is the source of the river. In summer it is not very impressive. But in the winter, when the pool surges up (covering the whole grotto hole) and pours over the area I was walking, to gush down the valley and become the Sorgue River. We walked back and took a tour through the paper factory which is run by a waterwheel just as it was done in the 15th Century. As you walk inside you can see the wooden mechanisms that power the inside mill using the force of the river. When you get inside you can see the men making the paper. They start with a metal tray with fine fenestrations. They dip it into the paper mulch and then pull it out shaking the water off. When it dries off they peel it off and lay it on the pile on the right. Then you go into the paper shop where they have thousands of papers to purchase. One that struck me was that of the Hippocratic Oath. They severely admonished against any photography in the shop. As you leave the mill there are a variety of shops and galleries. We stayed away from the candy and huge stacks of meringue. We got back to the center of town and it seemed everyone wanted to drink fresh Sorgue river water from the water fountain. It tasted great. 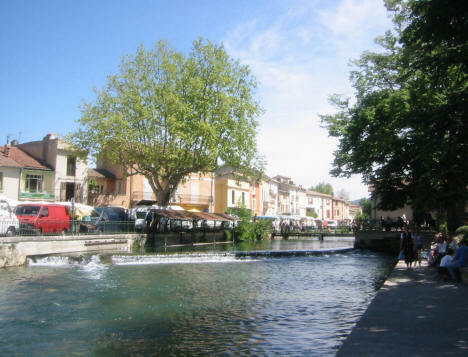 At 6:40 we finally left the town and headed for Arles but we had to drive through the famous little town of L'Isle-sur-la-Sorgue which sits between two branches of the Sorgue River and is almost an island. 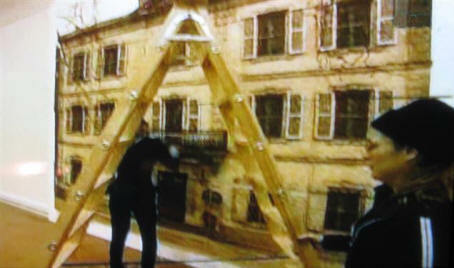 At 7:15, I started making calls to hotels in Arles and after several calls it became obvious that because of Bastille Day, there were no rooms available anywhere in the city. 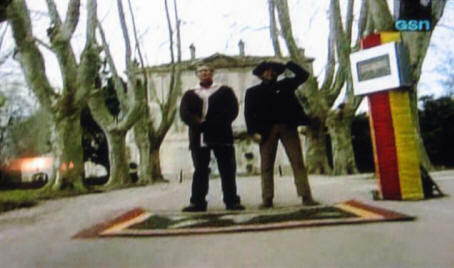 They said it would be impossible to find a room anywhere in Provence. Now I was really getting worried. 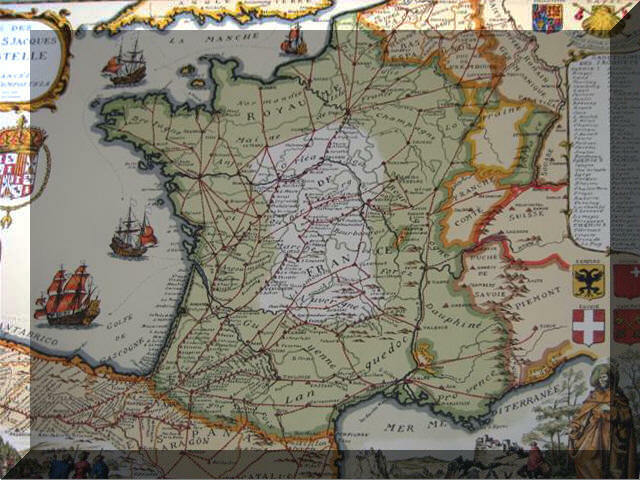 We started heading to the next available city on the map, St-Rémy-en-Provence. It was 25 miles away. We looked everywhere for hotels and didn't find any in town so we followed signs heading to a special place called Château Des Alpilles. I didn't get a picture of this place not knowing how famous it was. We pulled into the large estate with people having dinner out front in the yard. It was very fancy. I went inside asking for a room and the man told me I had to be kidding. Didn't I know it was a special holiday? He said there were no rooms anywhere. I begged him to try to find something for us. He then took me into the office and asked the lady at the desk to call around. After 15 minutes she said there was a place down the road that just had one room open up. I said that is all we need is one room. With sweat pouring down my brow, I raced out of there and we drove down the road and finally found the place which was 8 miles away. After you drive down this road you finally get to the hotel. [Petite rue des Baux, +33(0)4-90-92-4462] and they did indeed have a room. A woman who was staying there suddenly changed her mind and decided to go back to Paris today. If she hadn't I think we would have been sleeping in the car. This was a close call; one of the closest we have ever had. 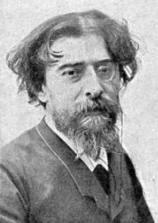 The rooms aren't numbered but they are named after famous artists; ours was "Daudet" for Alphonse Daudet (1840-97), a famous French writer (left) - I like his grooming. Phillipe and his wife Martina (below) own the place and they were very welcoming and took very good care of us. We unpacked very quickly and at 8:00 I was doing my run on the country road lined with plane trees which was downhill and very pleasant. The sun was out and the cool breeze was great. After trying to decide whether to eat at the formal dinning area (Le Saint-Georges, on the left behind Marcia) or in the bistro (center), we decided to go casual after this hectic whirlwind day. So at 9:00 we sat down for a relaxing dinner at the bistro. We sat in this lovely courtyard against the hotel and after I had two 1664 beers (1664 is a popular brand of French beer) and Marcia some rosé wine, we noticed this very large toad that decided to join us. They said he always comes around at dinner time. They brought us a bottle of the local wine. Marcia started out with melon and I had salade foies gras, which was excellent. Marcia and I both had Tuna (thon) which was also very good. I also had an omelet with ham and fromage (cheese), a popular dish for dinner for the French. I had a plate of local cheeses for dessert followed by a cappuccino and Marcia had peaches with gelato and a glass of port wine. We finished at 11:30 and went to our room. I discovered that my Sonicare toothbrush would no longer take a charge so now I can't use it anymore. The electronics demon has hit me yet once more. From here on in I will be brushing with a regular brush which I haven't done in 15 years. I work on stitching more panorama photos and got to bed at 2:45 AM.